Boo! Times can be scary, but I always find that entering a blog giveaway gives me hope and makes me smile (especially when I win!). So before you put those finishing touches on your Halloween costume and make that final trip to the grocery for more bags of candy, don't forget to leave links to your giveaways -- enter everyone else's, too! Happy Halloween! We are a selfish family when it comes to computers: Alfie and I each own a laptop, and we have upstairs and downstairs desktops, yet we always seem to be fighting for a computer. Our desktops are pretty old, so they're not very good for playing games or watching videos over the internet, and there's no way we're letting our messy (but lovable) little monsters near our laptops to play their games. Besides, the kids, especially 9 year-old Pea, are getting to the age where they're needing their own laptop for school. So getting an offer to review a kids' laptop was the perfect opportunity at the perfect time! 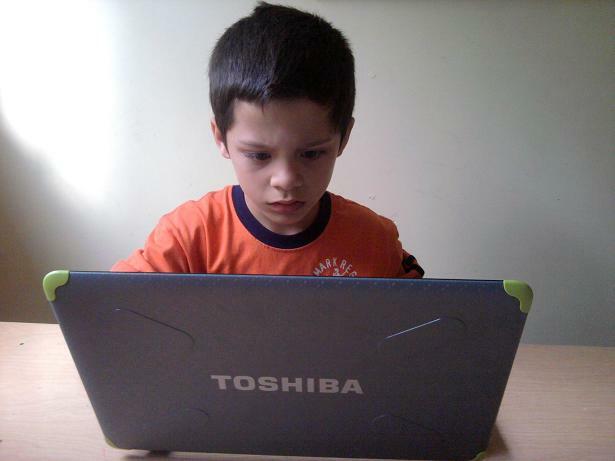 I was recently contacted by Technorati and Best Buy to review the new FIRST SPARK™ Kids PC featuring the Toshiba L635 laptop. Introducing the FIRST SPARK™ kids PC line exclusively at Best Buy®. Featuring the Toshiba L635. 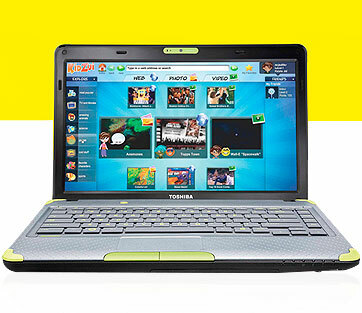 This full-sized laptop was made specifically for kids and their parents. Get peace of mind with hardware features like a wipe-able keyboard, and software to help you keep your kids secure while playing games or browsing the Internet. We received the laptop on Tuesday evening and spent a few hours making backup disks and creating accounts for each kid. You don't need to play with it for very long to appreciate the kid-friendly features, like the pre-loaded pre-loaded Net Nanny software and KidZui browser. I love with the wipeable keyboard at first sight; it's a single solid layer without any cracks for crumbs or liquid to fall into. It's also really sturdy, with rubber corners and anti-jog features that protect the hard drive from shocks and bumps. In fact, the very first laptop I bought with my own money was a Toshiba, and I chose the brand because of its reputation for sturdiness and the great value for money -- two features that make it a great first PC for kids! Stay tuned for more posts on how my kids are liking their new FIRST SPARK™ laptop... written by the kids themselves! Disclosure: I received First Spark kids laptop courtesy of Technorati and Best Buy, but was not paid to review the product or give my opinions. Product information is provided by Technorati and Best Buy, and is clearly indicated as such. The views and opinions expressed here are my own. Sun safety is a Big Deal in our household. Alfie is English, and my kids are half-English, and we all know fair skin is particularly vulnerable in sunny places like California. Alfie lived in Australia for 5 years, and he saw first-hand how the strong Australian sun have sent melanoma incidence rates skyrocketing in the fair-skinned Australian population. THAT is what happens without sunscreen, and it's a very bad thing. I still feel pangs of parental guilt looking at it. The sun always shines here in California, even in the fall, so sunscreen application doesn't stop after Labor Day. UV rays are present year-round, even cloudy days; in fact, those cloudy days are even more dangerous because they lull you into a false sense of security! I periodically blog about the things we do to keep our family safe in the sun, and most of those summer tips apply to the rest of the year. Okay, we don't exactly seek shade -- quite the opposite, in fact -- during those nippy fall days, but covering up is a no-brainer, so give yourself a pat on the back for that one! But we still wear hats (to protect us from the cold as much as from the sun) and put sunscreen on our faces. Coppertone Kids Continuous Spray, and that hasn't really changed. I HATE applying sunscreen lotion, so being able to just spray it on my kids is a godsend. But in the fall, I only need to put sunscreen on their face, since they're in long sleeves and pants anyway, and the continuous spray doesn't really work for faces. 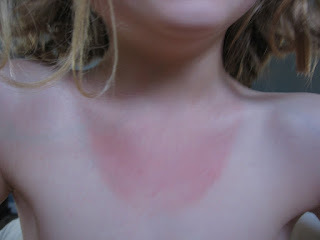 It gets in their eyes and stings, so I prefer the Coppertone Kids Sunscreen Stick SPF 55. It's just as effective as sunscreen lotion or spray: you get 55 SPF, waterproof formulation, and broad spectrum UVA/UVB protection -- but I don't have to get any icky-sticky lotion on my hands. I just swipe the stick all over their faces and necks, and voila, they're protected! 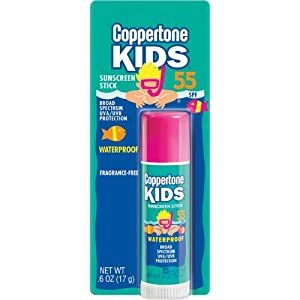 When Coppertone offered to send me a stick of Coppertone Kids 55SPF Sunscreen Stick to try out, I gladly said yes, because we go through a ton of these sticks. We keep them in our hallway closet, in the kids' schoolbags (so they can apply it on themselves at lunchtime) and in the car, so we can be sun-safe everywhere, even if we forget to apply lotion before leaving the house. They're hardly take up any room at all, so there's no reason not to stash one in every car or soccer bag or purse! Coppertone also sent me a bottle of Coppertone Water Babies SPF 100 Sunscreen Lotion, which I admit is not my favorite medium -- I've already said I hate the stickiness of lotion -- but it's probably your best choice for applying lotion for babies and toddlers because it's got an SPF factor of 100. They do have a Water Babies spray and a sunstick, but they only go up to 50 and 55 SPF, respectively -- so getting lotion on your hands is a small price to pay for protecting your baby with the highest SPF rating possible. So before you go apple picking or head out to watch a football game, don't forget to apply sunscreen! With so many options, why wouldn't you take just a couple of minutes to protect your family against the sun's rays? Disclosure: I received product samples from Coppertone, but was not paid to review the products or give my opinions. Product information is provided by the featured company/product and is clearly indicated as such. The views and opinions expressed here are my own. Great news, Northern California shoppers : Safeway is rolling out a new savings program called Just For U, and it's going to lower your grocery bills like never before. At first I was skeptical because I already love Safeway's Club Card program and I didn't want them to scrap it -- but I've since learned that the Just For U program doesn't replace the Club Card program, it enhances it. Now you can "download" manufacturer's coupons to your Safeway card! Instead of stealing the Sunday paper from your local coffeeshop, clipping out the coupons and having to remember to take them to the store, just go to the Safeway Coupon Center. They have hundreds of coupons every week (the largest online coupon center in North America! ), and all you have to do to get them is log on to your Safeway.com account, go to the Safeway Coupon Center and click on the coupons you want. They'll be registered on your Safeway Club Card, so when you buy the item at Safeway and use your Club Card, the coupon will be redeemed automatically. Based on your shopping history, the Just For U program creates a list of items you buy frequently (or items you might want to buy) and gives you a special price for them. These Personalized Deals are just that -- the Club Card shopper in front of you at the checkout stand will have a completely different set of Personalized Deals. To take advantage of these Personalized Deals, log on to your Safeway.com account, go to the Personalized Deals section and click on the products you want. Heck, click on all of them -- they're valid for 90 days and there's no item limit, and you don't need to do anything other than give them your Safeway card at the checkout line. Yup, you still get the Club Card Specials that you know and love. What's more, you can see all your current local Club Card Specials online, and even create and print a shopping list from that list of Club Card Specials so you don't have to wander the aisles searching for a Club Card Special you might need. You can also include Coupon Items and Personalized Deals in your Just For U shopping list so you don't miss any opportunity to save. 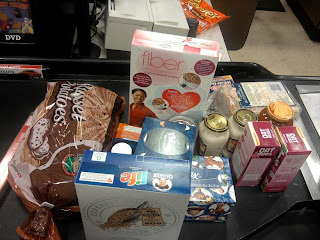 After our Just For U 101 session, we headed to a local Safeway store, where we were given a $50 Safeway gift card and told to shop for some items on our Just For U shopping list so we could see the savings rack up. I admit, I had visions of racing around Safeway, piling as many items into my shopping cart as I could get my hands on in 1 minute -- but sadly, there were no sweepstakes shopping races that day. Still, $50 is $50 and I wanted to see how far that money could go with the Just For U program. I love Oroweat's Country Buttermilk bread, but I don't buy it too often because it's expensive ($4.79) compared to Safeway bread. Even on sale, it's usually about $2.50. So I'm overjoyed that it's on my Personalized Deals list for only $1.95! 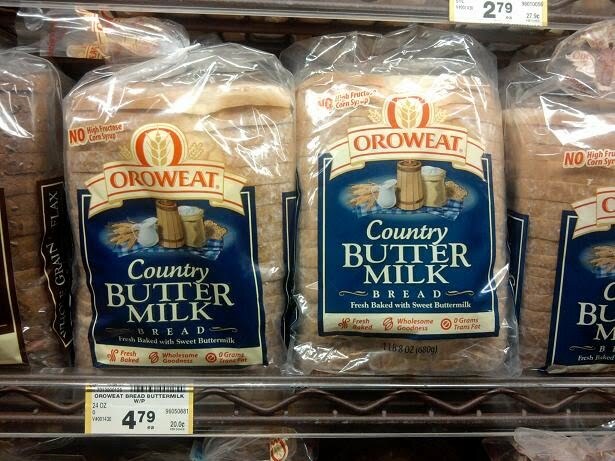 So I get to buy Oroweat whenever I want for the next 3 months without having to wait until it goes on sale, or having to hoard it and freeze it when it does. 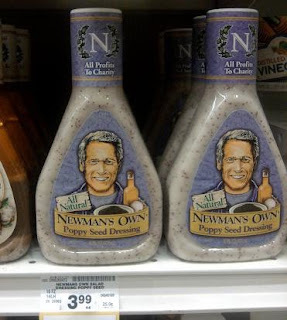 I think this is the first time I've ever used a manufacturer's coupon -- it was for $1 off a $4 bottle of Newman's Own dressing. Thanks to the Just For U program, I didn't have to clip any coupons or remember to bring them to the store. My purse is messy enough as it is without it being clogged with a bunch of paper coupons! 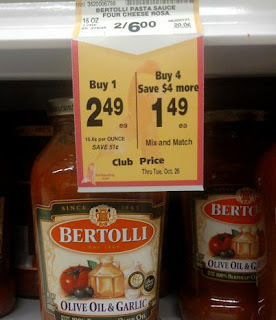 Bertolli pasta sauce is regularly $3 per bottle, $2.49 with Club Card savings -- but this happened to be one of my Personalized Deals items, so I only paid $2.02 for it! See that 10-pound bag of potatoes? It was on sale for 97 cents, and with the 50-cent coupon I got from the Coupon Center, I only paid 50 cents! Fifty cents for ten pounds of potatoes.... what is this, 1945? At that price, we'll be having potatoes for dinner for the next 3 days! In total, I bought $57.38 worth of groceries and paid $36.89, for a total savings of 36%. I like to take note of the "Total Savings Value" that gets printed on my Safeway receipt, and usually it's in the 20%-25% range, so 36% was phenomenal for me -- and it was all thanks to the new Just For U savings program. Of course, I did have to do some pretty careful planning -- I stuck to my Just For U shopping list which only contained items that had coupon savings, Club Card Savings or Personalized Deals (or a combination), and I was pretty meticulous about making sure I was getting the correct item and size to qualify for the discounts. Truthfully, I don't really like having to print out a shopping list -- but once Safeway rolls out a Just For U mobile app for the Android platform (they said it's in the works), I'll be able to whip it out to remind myself of the discounts that are currently on my Club Card -- then I'll be unstoppable. Disclosure: I was invited to a blogger event that included breakfast and lunch. At the event, I was given a $50 Safeway giftcard so I could shop and see how the Just For U program works; I was also given an assortment of Safeway groceries and a second $50 Safeway giftcard to take home. The views and opinions expressed here are my own. This week we were given a real treat: we received tickets from Feld Entertainment to the opening night of Disney on Ice: Mickey & Minnie's Magical Journey! We've already been to the Worlds of Fantasy show earlier this year, and the Princess Classics show last year, so before the show started I wondered whether the kids (as well as the grownups) might feel like they've seen it all before -- but I needn't have worried. Mickey & Minnie's Magical Journey is a totally different experience and a totally new journey! The show opened to Mickey, Minnie, Donald, Daisy and Goofy all dressed in cute safari outfits, ready to go on safari -- so it was not surprising that the first act featured The Lion King. We had seen The Lion King segment on Worlds of Fantasy, but somehow this one was different. For one thing, the stage had a really creative 2-tier setup, with a balcony at the rear of the stage where a lot of the storytelling could go on while the ice skating occurred nearer the front. Same with the second act, The Little Mermaid; Sebastian was a hit, as ever, with his crowd-raising performance of Under the Sea (I love his initial "Clap on the half shell..... Two Beats!" little rap number to get the crowd to clap their hands). The costumes were completely different from any Little Mermaid ice number I've ever seen (and I've seen a few! ), and for the first time ever they featured all of Ariel's mermaid sisters in a musical number. The kids all loved it because it was new, fresh and fun. The last 2 acts were completely new to us. Act 3 was Lilo and Stitch, and boy did I enjoy this one. They had lots of catchy Hawaiian numbers as well as a slew of Elvis songs! The last act, Peter Pan, took up the entire second half, and was really good. They went all out on the props for this number, with a huge pirate ship, complete with a giant skull on the prow, and a gigantic crocodile ready to swallow up Captain Hook. 3Po started jumping in his seat with excitement when he saw a dozen or so pirates skating into the rink, and sure enough, it was probably the best number of the night, with a musical medley combining classic pirate ditties, music from the Pirates of Penzance and music from Peter Pan. We all left with smiles on our faces and Disney tunes on our lips. After watching this show I can definitely say that each of the Disney on Ice shows is unique and entertaining -- enjoying this show with your kids is a tradition you definitely want to cultivate! There are only 3 more shows scheduled for the Bay Area -- tomorrow. October 24, at 11pm, 3pm and 7pm at San Jose's HP Pavilion -- so hurry and buy tickets NOW! And here are some great promos you can use to save on tickets to the show! Log on to http://www.ticketmaster.com/promo/ajyhf0 and enter redemption code. Even if you don't live in the Bay Area, you can still catch this great show; here's a list of the remaining shows for Mickey & Minnie's Magical Journey in 2010 and 2011. I don't know if the discount code above is good for all these cities, but try entering it, it's worth a shot. And if this show isn't coming to a city near you, Disney on Ice has several other touring shows, including Princess Classics, Princess Wishes, Let's Celebrate and more. For the full Disney on Ice show lineup, go to http://disney.go.com/disneyonice. Disclosure: I am watching the show with my family courtesy of Feld Entertainment. Show information is provided by the featured company and is clearly indicated as such. The views and opinions expressed here are my own. Star in a Disneyland Castle Show or TV Ad -- and "Let the Memories Begin"
One of the most memorable experiences we had during our trip to the Disneyland Resort last month had nothing to do with seeing the beautiful fall decor, meeting a couple of Disney Villains, experiencing the spooky touches of Halloween Time at the Disneyland Resort, being treated to a fabulous dinner at the Big Thunder Ranch or even getting a special spot to view the new "World of Color" light and water show at Disney's California Adventure. No, it had everything to do with getting up early, being in the right place at the right time, and getting sprinkled with just a bit of pixie dust and Disney Magic. On September 19 we were selected to be Family of the Day at Disney's California Adventure Park. Every morning they choose one family at random to be the first family in the park and open the park up to the rest of the visitors, and on that special day, we were the chosen ones. We were at the front of the line waiting to be let into DCA, but so were many other families, so we were quite lucky to be chosen! As Family of the Day, we got the royal treatment. 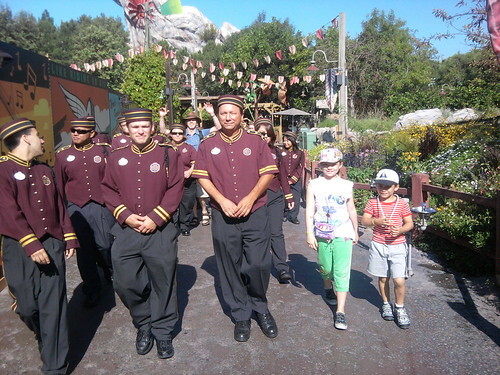 First off, we were escorted into the park by a group of about fifteen or so Tower of Terror bellhops (as well as two very special bellhops, Chip and Dale! ), who walked beside (and in front and behind) us from the park entrance to the Tower of Terror. The kids (okay, the grownups as well) got a real kick out of having a cavalcade of our own personal attendants, and they loved being able to pose with Chip and Dale without anyone else waiting in line. 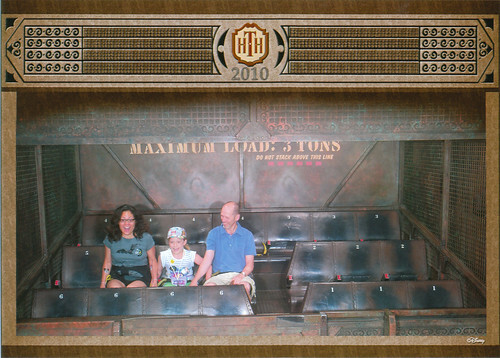 Since we were the first family in the park, we were also the first to reach the Tower of Terror. Once there, we signed their Family of the Day guestbook and posed for a photo taken by the park's roving Photopass photographers. As Family of the Day, we even got our own private elevator ride on the Tower of Terror! After the ride ended, a bellhop surprised us yet again with a complimentary photo of Alfie, The Pea and I screaming as our elevator plunged us to our doom (3Po and Jammy were quite envious of our photo, but not enough to overcome their terror of the Tower of Terror). As if all that weren't enough, as Family of the Day, we were given complimentary Fast Passes to the ride of our choice. The whole thing was such a special experience, and one we will treasure forever! Perks aside, we all agreed that being treated like someone special really made us feel special, which made becoming Family of the Day such a wonderful memory. I think every family wants to feel special, and that is why the Disneyland Parks are coming up with a wonderful program to make every family feel special in 2011. Beginning in January 2011, Disney PhotoPass photographers will be sharing photos they've taken of Disney Park guests in a larger-than-life way: at the Walt Disney World Resort, they'll be projected on the soaring spires of Cinderella Castle in Magic Kingdom, and at the Disneyland Resort, they'll be projected onto the “it’s a small world” building. As many as 500 photos will be used per day, so make sure you pose for those PhotoPass photographers and you could be featured in the show! Also, Disney Parks will be making user-generated content part of future TV commercial spots, print advertisements, newsletter articles and vacation planning video segments.You can share your own Disney Park memories by uploading photos and videos at www.DisneyParks.com/Memories; some memories will be shared online, while others may be selected to share in print ads, brochures and other marketing – including television ads to air across the United States and Canada. Imagine starring in a Disney Parks ad -- how special would that be? It's all part of Disney Park's 2011 ‘Memories in the Making’ campaign, which will celebrate the family vacation memories created in Disney theme parks every day. Disclosure: I did not receive a sample or monetary compensation for this post. The trip I am blogging about was a Disney-sponsored mom blogger event. The views and opinions expressed here are my own. 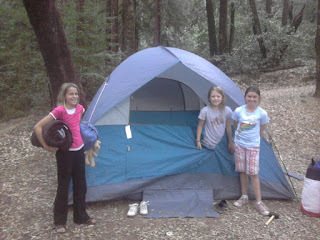 Last weekend I chaperoned The Pea's Girl Scout troop on an overnight camping trip. We had so much fun, and one of the parts they most enjoyed was getting to set up and sleep in a tent. We've owned a Coleman 6-person Sundome tent for about three years now, and it has always served our family well. Every time The Pea's troop goes camping, their leader borrows our Sundome tent because it's roomy and easy for the girls to set up. Coleman recently sent me the latest version of the Sundome tent to go camping with -- so now their leader gets to borrow two Sundome tents! This new Sundome tent is almost exactly like our old one; the only differences are that the new one is a different color, has two doors instead of one and has a removable zippered privacy wall that can turn the inside of the tent from 1 huge room into 2 smaller ones. Otherwise it's pretty much the same Coleman tent that we know and love. Coleman's Two-Room SunDome Six-Person Tent is roomy enough for the whole family to enjoy, but also provides a little privacy. This 12-feet by 10-feet two-room tent can sleep up to six people at a time in complete comfort. The Coleman exclusive Weather-Tec system is guaranteed to keep you dry and includes: a waterproof floor, leak-free and protected seams, weather resistant fabric, a strong frame design, and the zipper guard system. With 72-inches of vertical space in the center there is plenty of head room, and the two large doors make entering and exiting an easy affair. The zippered privacy wall is removable in case you want to convert your tent in to one big space. This tent includes a rainfly that covers the doors and windows for protection from the elements, as well as separate storage bags for the tent-poles and stakes and easy-to-follow set up instructions sewn into the carry bag. Features include a mesh vent to keep your tent fresh, heavy-duty welcome mats, and Cool-Air ports to further adjust ventilation or access your gear. 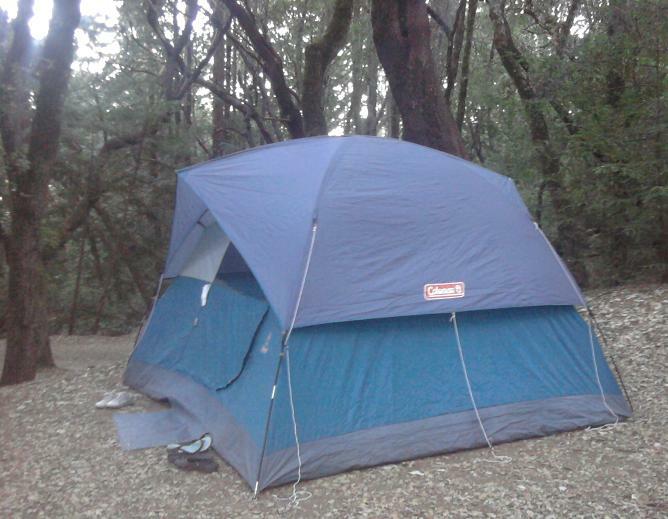 Shock-corded steel poles will keep this tent a sturdy haven from the weather for years to come. * It's easy to set up -- so easy, in fact, that 3 9-year old Girl Scouts could (and did) set the tent up by themselves! Okay, I did help, but only a little (mostly to hammer down tent pegs into the hard ground and to be the 4th person to spread out the tent and prop the poles up). Having the instructions secured to the carry bag is a huge help. * It's large -- large enough for 6 adults (supposedly, but we've never tried it), and certainly large enough for our family of five with all our gear. I love, love, love that it's high enough for Alfie and I to stand up straight when we're in the middle. * It's inexpensive -- at $150 MSRP (and I've seen it on Amazon for $109.99), it's the perfect tent for a family that's just starting to go camping, or a family with young kids who want to limit their camping to the backyard variety, or a family on a budget. 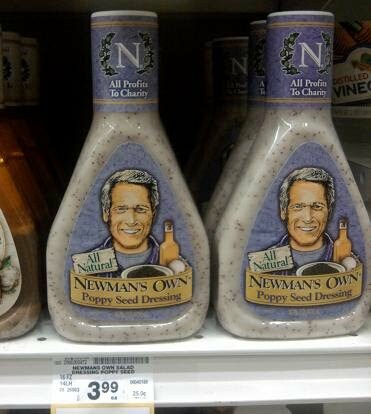 It's great that Coleman has so many high-quality options! *It has great little touches like a "welcome" mat, interior gear pockets, 2 doors and zip-down windows. My kids fight like crazy to zip down the vent windows to let air (but not mosquitoes) flow through the mesh, and even though we don't like to use it, I can imagine the privacy wall is great if a group of couples are all camping together. The rainfly doesn't go all the way down to the ground; it only reaches halfway down the tent, so cold air seeps in through the bottom and into the tent, which can mean seriously cold nights unless you have a good sleeping bag (or four thick layers of clothing). Coleman's 6-person Sun Dome tent is an affordable family camping tent that does the job -- just make sure you camp in warm weather! 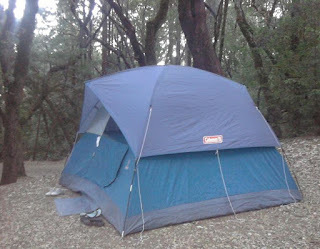 Disclosure: I received a camping tent from Coleman to review. I was not paid to review the product or give my opinions. Product information is provided by the featured company/product and is clearly indicated as such. The views and opinions expressed here are my own. As the Energizer Keep Going Blogger for San Francisco, I was given the incredible opportunity to participate in the Susan G. Komen 3-Day for the Cure event on October 1-3, and blog about it from start to finish. Their Keep Going Blogger program is just one of the many ways that Energizer is helping to increase awareness and support for breast cancer research, and through my contact with Energizer I've gotten to know all the other ways that they are helping with this important cause. * Energizer is the presenting sponsor for the Susan G. Komen 3-Day for the Cure event, for the second year in a row. At each and every one of the 15 3-Day events around the country, Energizer has a huge presence, from the thousands of foam bunny ears distributed to event participants, to the Energizer tent that tired walkers can head to and get a soothing massage, to the complimentary cell phone chargers they loan to tech junkies like me who can't imagine going for 3 days with a dead phone. * Energizer's commemorative pink batteries are on sale for the month of October at retailers nationwide. These limited edition pink AA and AAA Energizer Max batteries have been turned pink in an effort to encourage consumers to support the Komen Foundation. * the Energizer Family of brands, including Playtex® feminine products, Wet Ones® wipes, Playtex® Living Gloves® and Energizer® MAX® Batteries – will be joining the battle against breast cancer with a $400,000 donation to Susan G. Komen for the Cure during Breast Cancer Awareness month in October. Disclosure: I received an assortment of Energizer pink batteries, but was not paid to review the product or give my opinions. Product information is provided by the featured company/product and is clearly indicated as such. The views and opinions expressed here are my own. I've got three weeks to go before the Big Sur Half Marathon, and training is proceeding smoothly. I'm walking/running three times per week, so hopefully during the Big Day I should be alright. I'm not aiming to run rings around everyone else; in fact, I've accepted that I won't be able to run the whole way. I'll have to do a combination of running and walking. The mix that seems to work for me at this point is about 20 minutes of running, followed by 30 minutes of walking. Hopefully I'll be able to push that to 50-50 during the actual race. Since I'll be on the course for quite a while (I'm hoping to make it under 3 hours, or just over), I'm definitely going to be taking along the W-Series Walkman that Sony sent me as one a Sony Walkman Runner. The website on the Big Sur Half Marathon says that the use of headphones is banned for the competitive runners, and discouraged among everyone else -- but if you do want to use it, then use caution. I'm definitely using mine, and I'm taking comfort in the knowledge that with the W-Series, at least I won't be distracted with all those wires bouncing around! The one-piece music player that's ready for the treadmill, trail, or gym, designed to stay put and out of the way while you work out. With true-to-life sound and deep bass, plus a water-resistant2 seal to keep the sweat out, the W Series music player works with you to hit your personal best. * Easily load your music by dragging and dropping music files from iTunes®, Windows® Media Player or Rhapsody. * It's so easy to transfer music to the device. You can use Windows Media Player, Content Transfer (which lets you transfer songs from iTunes!) or simplest of all, you can even use plain old Windows Explorer -- just drag and drop! * Each of the earpieces fits snugly into your ear, so the sound is wonderful. The W-Series comes with an assortment of earbuds so you can find one that fits comfortably for you. Controls are located on the earpieces; they're simple (but not exactly easy) to use, requiring only a pressing or toggling motion. * Best of all, NO WIRES. No more wires jiggling and bouncing in front of you, no more wires to wind up when it's time to put it away, no more wires to untangle and sort when you want to use it again, because let's face it, no matter how neatly you've wound it up, it always seems to get tangled again! * It has been quite difficult to get used to managing the controls; I'm still constantly fumbling around, not knowing whether I've clicked the volume or the shuffle/playlist button or jogged the play/pause/forward/rewind button. The instructions don't seem to help me much either! Maybe I have extra-fumbly hands or I'm just not used to it, but the learning curve seems kind of steep. * The unit cannot be connected to a computer with a generic USB cable; you have to use the USB cable that comes in the W-Series package, or it won't work (and believe me, I've tried). We have so many USB cables around the house, and I'm used to just grabbing any of them, so I find it inconvenient to hunt around for this one particular black cable in a sea of dozens pushed into our cable drawer (told you I hate cables). But the cool design, great sound and ease of use do make up for them! The W-Series Walkman is PERFECT for running and exercising because of its no-fuss, no-hassle wireless design. Once you get used to handling the controls, you'll be off and running and on your way! Disney has certainly put their stamp on almost all the classic fairytales (an entire generation of Little Mermaid fans don't realize that the original Little Mermaid got turned to sea foam! ), and next month they're going to do the same with Rapunzel. Tangled is opening in theatres everywhere on Wednesday, November 24 in Disney Digital 3D, and I for one am really looking forward to seeing it. As many of you may know, Tangled is Disney’s take on the classic story of Rapunzel. I love what they did with The Princess and The Frog, and I can't wait to see what they do with Rapunzel! * Rapunzel has 70 feet of golden hair and more than 100,000 individual strands. * If all the hairs on a single head of hair 12 inches long were laid end-to-end, they would stretch 26 miles. If all the hair on Rapunzel’s head were laid end to end they would stretch for 1,820 miles. * Special software had to be created to simulate movement for the hair, no one had ever animated that much hair before and no leading lady has ever had that much hair before! * The software engineer responsible for creating the hair simulation for Rapunzel and all of the film’s main characters got her computer science PhD in the study of hair, and has spent the last ten years specializing in that area. 6) Write on the Tangled Facebook page, telling them Bonggamom sent you, and telling them which of character you think you're going to like the best (1 entry). However, if the winner's choice is not available, Disney reserves the right to select the closest available alternative. US addresses only. For additional giveaway rules, click here. Good luck! Disclosure: I will be receiving an assortment of Tangled merchandise, but was not paid to review the product or give my opinions. Movie information is provided by Disney and is clearly indicated as such. The views and opinions expressed here are my own. Welcome to Bonggamom's Friday Finds! Any Halloween-themed giveaways out there? I'd love to find out about them, so leave a link! Any non-Halloween-themed giveaways? Leave a link for those too! Sorry about all the exclamation points, I always get overexcited at this time of the year! This October, Cheryl’s gourmet desserts will honor National Breast Cancer Awareness Month and the millions of Americans affected by the disease with the company’s “Cookies for a Cure” campaign. Cheryl’s will donate 10 percent of the proceeds from sales of their Buttercream Frosted Heart Shaped Cookie to the Susan G. Komen foundation throughout the month of October. I've tasted Cheryl's Cookies before and I think they're delicious! During the fall of 2010, Eggland’s Best will display the Komen for the Cure’s running ribbon logo (along with a pink version of the “EB” stamp) on all their egg varieties. Eggland’s Best will also donate $50,000 to support Susan G. Komen for the Cure® in its promise to save lives and end breast cancer forever -- so by buying Eggland's Best eggs, you're supporting a company that supports a very important cause. Better Bit of Butter Cookies is announcing new this season their Daisy Pink box of mini cookies to benefit Breast Cancer. Better Bit of Butter Cookies will donate $5 dollars from every Daisy Pink box ordered during the month of October. These cookies are beautifully decorated and deliciously tasty, they come recommended by DailyGrommet.com and AmyAtlasEvents.com. Note, I went to their website and it looks like you need to custom-order everything, so you'll have to call or email them to ask if the Daisy Pink box is still available. In honor of Breast Cancer Awareness month, Ghirardelli LUXE MILK is on a journey to raise up to $100,000 for the National Breast Cancer Foundation (NBCF). To start with, they're donating $50,000. As for the other $50,000, that's where you come in -- you can help by purchasing a specially marked pink bar or bag of LUXE MILK. Each specially marked product contains a unique prize code and for each code entered at www.ghirardelli.com/LuxeMilk, LUXE MILK will donate $1 (up to $50,000) to the NBCF. As an added bonus, when you enter your code at www.ghirardelli.com/LuxeMilk, you will be automatically entered to win instant prizes, including Cole Haan gift cards. Any other pink foods you know of? Leave a comment here! Disclosure: I did not receive a sample or monetary compensation for featuring any of the products on this post. I have not reviewed any of the products on this post. The views and opinions expressed here are my own. Who doesn't love a carnival game? Every time we go to Reno, we stay at the Circus Circus Hotel, and every time we tell the kids, "We're not playing games at the Midway this time". 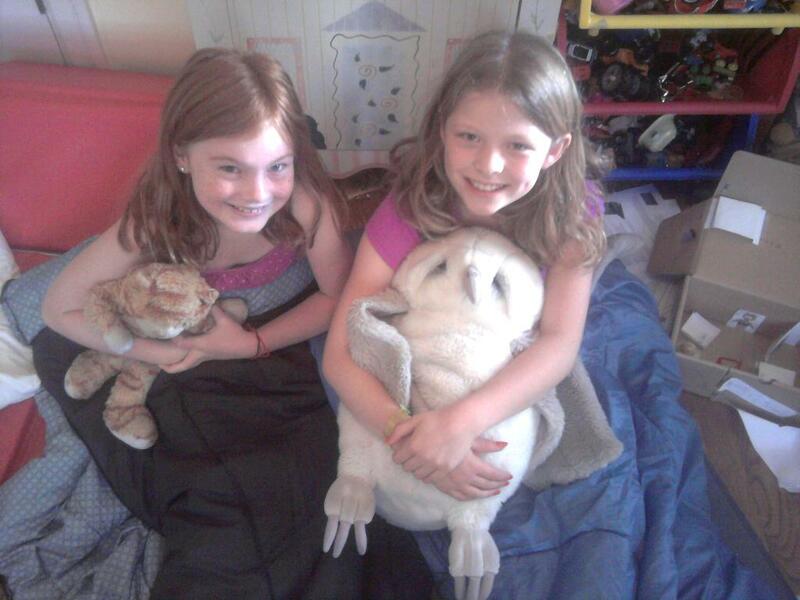 And every time we change our minds and end up with tons of stuffed animals to add to the kids' collection. Fishing for prizes, popping balloons, knocking down cans, tossing quarters and hitting rubber chickens into rotating pots are just so much fun! When I was invited to review 2KPlay's New Carnival Games, I knew my kids were going to love it -- but I didn't realize I'd enjoy playing it too. New Carnival games has over 30 new carnival-themed games, 300 new prizes and new features for both the Wii and the DS versions. New Carnival Games is a collection of dozens of touch screen-controlled midway challenges, in the family friendly style of the original. DS gamers of all walks can have a go at "Balloon Blowout," "Pie Eating Contest," "Pop-A-Score," "Speed Pitch," and other activities, all inspired by contests of luck and skill. Each game is controlled with intuitive taps and flicks of the stylus or fingertips. Success is rewarded with prizes, including accessories that players' in-game characters can wear, such as rabbit ears, a walrus mask, or dragonfly wings. New Carnival Games for Wii features over 30 all-new games and attractions, including Pitch-A-Plate, Bottle Stand-Up, Fish Bowl Bounce, Gold Rush Alley Ball and the always frightful Haunted House. In addition, skilled gamers will earn tickets that can be redeemed for over 300 colorful in-game prizes, such as Moon Rocks, Eye-Bots, Decoder Rings and Wacky Wearables™ ranging from a Walrus Mask to Dragonfly Wings. In a franchise first, New Carnival Games is Wii MotionPlus compatible, so players will be tossing coins, bouncing balls, shooting targets and bumping cars with increased accuracy and more precision than ever before. The new multiplayer feature allows for cooperative play and head-to-head competition in every game - enabling kids, parents and grandparents to all play together in games like Lucky Toss, Gone Fishin’ and Speed Bingo. New Carnival Games has a suggested retail price of $49.99 for the Wii MotionPlus bundle, $39.99 for Wii and $29.99 for DS. The games are rated E for Everyone by the ESRB. I can't speak for the Wii version since we don't have a Wii, but my kids love the Nintendo DS version. I constantly hear peals of laughter whenever one of them gets a game high score and gets their photo taken looking oh-so-ridiculous. I swear, they take it as seriously as they would a real carnival game, the way they concentrate and the way they cheer when they do well on a game and win lots of tokens. They love redeeming the tokens for little clothes and masks that they can put on the character, just the way you can redeem tickets at a video arcade for little plastic prizes. I must say, I prefer the virtual prizes because they don't clutter up the house, and I'll never have to sneak around to throw them away when the kids aren't looking! Even I like playing New Carnival Games because the games just my style: easy to learn, simple and short. There's no back story, so I can play a game without reading a gazillion lines of instruction. I can get a few minutes of lighthearted diversion, then move on. No fuss, no hassle, perfect! Plus, the carnival games are fun! I can't really say anything bad about this game: no violence or sexual themes, and the games are short so it's easy to get the kids to put the game down when their screen time has run out. Of course, it's not exactly what you call educational, but then neither is a real carnival game. New Carnival Games for Nintendo DS is lighthearted fun for the whole family! One lucky Bonggamom Finds reader will win a New Carnival Games videogame in their choice of platform: Nintendo DS or Wii. Leave a comment on this post and tell me which carnival or arcade game you like to play, or tell me the biggest prize you've ever won from playing a carnival or arcade game. This entry must be completed before extra entries qualify. 4) Write on the Carnival Games Facebook page wall, telling them Bonggamom sent you (1 entry). This giveaway ends at 11:59PM PST on November 10, 2010; I will draw a winner at random on November 11 and post the winner's name after the winner confirms acceptance. US addresses only. For additional giveaway rules, click here. Good luck! Disclosure: I did not receive a sample or monetary compensation for this post. I received a product sample, but was not paid to review the product or give my opinions. Product information is provided by the featured company/product and is clearly indicated as such. The views and opinions expressed here are my own. BEEP...... BEEP....... BEEP........ BEEP......... Every now and then we get woken up in the middle of the night by our fire alarms going off. It's a heart-stopping moment, and one that always gets Alfie and me rushing around in a panic (the kids never wake up -- which is one of the reasons why Alfie and I hate spending more than 2 or 3 nights away from them!). Fortunately, it has never been due to a fire, just our high-tech smoke detectors warning us that the batteries are running out. Panic quickly recedes to extreme annoyance, and we always chide ourselves for not remembering to replace the batteries before they actually run out and scare us half to death. Somehow we never seem to remember when we last changed our smoke detector batteries! I was recently introduced to a program that could silence those low battery beeps in our home forever -- Energizer's and the IAFC's Change Your Clock Change Your Battery program, a simple but important reminder to check and change the batteries in your smoke alarms when Daylight Savings Time ends in the fall. What could be simpler or easier to remember? Daylight-saving time ends Sunday, Nov. 7, and marks the 23rd anniversary of the Change Your Clock Change Your Battery® program, created by Energizer and the International Association of Fire Chiefs (IAFC), which reminds people to check and change the batteries in their smoke alarms and carbon monoxide detectors during the fall time change. This message is simple, and the habit can be lifesaving. Forty percent of fatal fire injuries occur in homes without working smoke alarms, while 23 percent occur in homes in which at least one smoke alarm is present but fails to operate. Firefighters work tirelessly to help reduce the risk factors by educating their residents on the importance of having a working smoke alarm. In many communities, fire departments are able to distribute free batteries to citizens in need as a result of the Change Your Clock Change Your Battery program. Over the past 22 years, Energizer has donated more than four million batteries to local fire departments. 1) Visit the CYCCYB tab on the Energizer Bunny® Facebook page, www.facebook.com/energizerbunny, and make the pledge to change your batteries on November 7, and Energizer will donate 1 battery* to a local fire department to distribute to citizens in need. 2) Share this information with your Facebook and Twitter friends, and Energizer will donate 3 more batteries*. 3) Share your family's home escape plan and Energizer will donate 5 more batteries*. 4) Enter the Energizer sweepstakes to win a smoke alarm/carbon monoxide detector for you and a friend. Need more incentive to spread the word? How about a giveaway? One lucky Bonggamom Finds reader will win a Fire Safety Prize Pack courtesy of Energizer, consisting of a First Alert smoke, along with a 2-pack of 9volt Energizer Max batteries. Get Energizer to donate a battery via their Facebook program -- basically, visit CYCCYB tab on the Energizer Bunny® Facebook page and do either #1, #2 or #3 above. Then come here and leave a comment telling me which one you did. This entry must be completed before extra entries qualify. 1) Send an email to 5 friends and remind them to change their batteries when they change their clocks, then leave a comment here telling me you did (1 entry). 2) Share the link to this giveaway (http://tinyurl.com/2g5mjk5) with your Facebook friends, then leave a comment here telling me you did (1 entry). 6) Follow Bonggamom Finds on Networked Blogs (1 entry). 7) Follow Bonggamom Finds on Blogger(1 entry). 8) Join any of the giveaways currently running on Bonggamom Finds (1 entry for each giveaway you've joined). This giveaway ends at 11:59PM PST on November 7, 2010; I will draw a winner at random on November 8 and post the winner's name after the winner confirms acceptance. US addresses only. For additional giveaway rules, click here. Good luck! Disclosure: Energizer will be sending me a smoke alarm and battery pack similar to the one they are providing as a giveaway prize. Program information is provided by Energizer and is clearly indicated as such. The views and opinions expressed here are my own. If there's anything I love more than the romantic ambience of candlelight, it's the romantic ambience of a cozy fire. Unless we're the one lighting and stoking it. The flaming part is great; it's just the preparing and the cleanup part that's hot, sooty and frustrating! We haven't lit a fire in our fireplace for so long that we actually decided to board up our chimney. I miss that crackling fire, but fortunately My Blog Spark and Febreze have come to my rescue by introducing me to a candle that actually mimics the sound of a crackling indoor fire -- Febreze Home Collection's Wooden Wick Candles. Febreze Wooden Wick candles recreate the calming crackle of a fire and last for up to 80 hours. Available in nine premium scents, these tranquil candles are specially designed with a wooden wick to recreate the ambiance and sound of a crackling fire indoors. Offering a brilliant range of everyday fragrances, Febreze Home Collection Wooden Wick candles can help inspire a scent and design transformation in your home. Be sure to look for Febreze Home Collection Wooden Wick candles at your local Walmart in fragrances like Green Tea Citrus, Pomegranate Mango, Cranberry Pear, Orange Honeycomb, Rosewood Plum and Willow Blossom; as well as seasonal scents that include Anjou Pear Spice, Gingersnap Vanilla, and Yumberry Sangria. Check out Febreze on Facebook and Twitter today! Visit Febreze on Facebook or Febreze on Twitter and “Like” or “Follow” the brand to keep up with the latest news from Febreze. I received 3 Febreze Wooden Wick candles from Febreze and MyBlogSpark, and at first I couldn't really tell what made it different from other candles. Sure, there was the wooden wick, but so what? Then I lit the first candle -- and I knew. The wooden wick crackles and pops when it's lit, sounding for all the world like a miniature fireplace! It's amazing how cozy and calming it sounds! This candle truly engages the senses. You see the beautiful, vibrant color of the candle and the merrily flickering flame. You touch the smooth, gleaming glass jar (and by the way, the sticker removes really easily so you can display the candle in your home without looking like a brand advertisement). You hear the cracking sound. You smell the wonderful aroma. Okay, you don't taste the candle, but the way the Cranberry Pear (and also, I'm sure, the Gingersnap Vanilla) smells, you can almost imagine something hot and bubbly waiting in the kitchen for you to devour while you're sitting in front of that crackling fireplace. It's quite a unique experience, and one I'll be enjoying on these chilly autumn nights! The scents are hit-and-miss. The whole family loved the Cranberry Pear scent and thought the Rosewood Plum scent was quite pleasant (even if it did smell like a musty Victorian posy), but none of use liked the Anjou Pear Spice. Fortunately, with 6 scents, including 3 separate seasonal scents, there's a good chance you'll fall in love with at least one. Febreze Wooden Wick candles are a heavenly way to set the mood for a cozy evening in front of the fireplace (even though you don't have one) on a chilly autumn night. Win a $15 Walmart gift card! One lucky Bonggamom Finds reader will receive a $15 Walmart gift card courtesy of Febreze, through MyBlogSpark -- a great way for you to purchase your own Febreze Wooden Wick Candle at your local Walmart or at Walmart.com. Leave a comment on this post and describe how you would use the new Wooden Wick candle to create your 80 hours of ahhhhhhhh. This entry must be completed before extra entries qualify. 4) Follow Bonggamom Finds on Blogger(1 entry). 6) Join any of the giveaways currently running on Bonggamom Finds (1 entry for each giveaway you've joined). 7) Write on the Febreze Home Collection Facebook Page and tell them you've joined the giveaway on Bonggamom Finds, and tell them which Wooden Wick candle scent you are most looking forward to trying. This giveaway ends at 11:59PM PST on November 4, 2010; I will draw a winner at random on November 5 and post the winner's name after the winner confirms acceptance. US addresses only. For additional giveaway rules, click here. Good luck! Disclosure: I received a product sample and $15 giveaway gift card from Febreze through MyBlogSpark, but was not paid to review the product or give my opinions. Product information is provided by the featured company/product and is clearly indicated as such. The views and opinions expressed here are my own. Last month I had the pleasure of meeting up with some of my momblogger friends at a luncheon hosted by Stefania of CityMama, Roxanne of Rox and Roll and Sony. 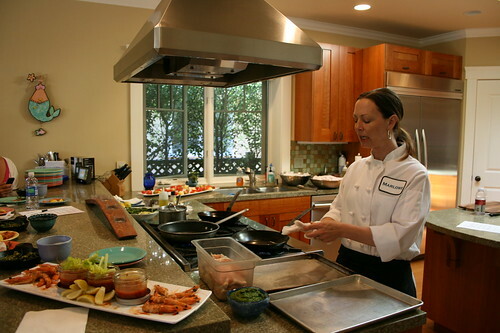 Chef Jennifer Puccio of Marlowe restaurant in San Francisco was there to demonstrate some recipes even busy moms can make in a jiffy. 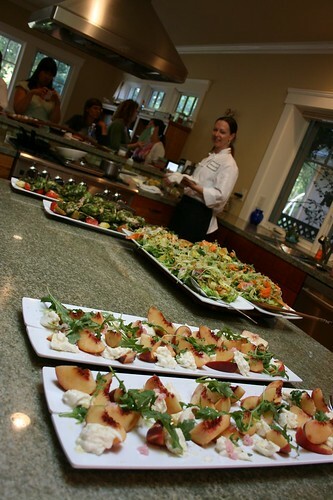 Chef Jennifer showed us how to make an awesome appetizers, pesto chicken, a fresh veggie salad and a peach-and-arugula salad. The resulting meal was absolutely divine in every sense of the word. I can't believe how easy she made it look to prepare, I cannot believe how pretty each dish looked, and I cannot believe how delicious everything tasted. The fact that a real live chef made these dishes usually means (to me, at least) that ordinary people can't make them -- either they require some special technique or they require so much time and effort that I just can't be bothered -- but I've actually made the White Peach & Berkeley Burrata dish twice; each time it has been so easy to make, and each time it has been gobbled up in an instant. The theme of Meals in a Dash was perfect, considering Sony had invited us there to introduce us to the new Sony Dash, a personal internet viewer you can keep on the kitchen counter, on the corner table in your guest room, on your nightstand, or anywhere you would want to access the internet in a flash without the hassle of booting up a computer. 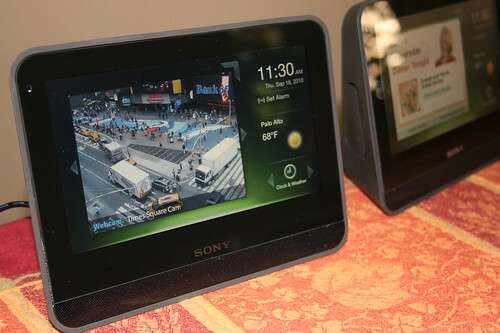 Sony gave each blogger their very own Dash to keep, and I must say it's the best digital photo frame/glorified alarm clock/recipe finder/YouTube viewer/gadget to get a quick Internet fix I've seen. The kids say having this Dash kind of makes up for our not owning an iPad, because with the Dash you can do things like view photos from Facebook, browse headlines, check your Twitter stream, listen to Pandora radio, . The 7-inch screen is big enough for them to view their favorite YouTube videos, and they love the touchscreen. I love way you can personalize apps for each member of the family as well as guests. It sure makes checking your email quicker and easier than having to boot up a computer, and it's the perfect way to check the weather or catch the morning headlines while you're waiting for coffee to brew, or munching on your breakfast cereal! The blah? Much as I love Sony, I think they missed the mark by keeping the Dash leashed to a plug and an outlet, instead of giving it a battery so we could carry it from room to room around the house, or even take it to Starbucks or some other place with WiFi. And it would be nice to be able to use the Dash as a digital photo viewer even if you don't have WiFi (there is a USB port that you can plug a USB storage device into, but nothing works unless the device is able to locate and access a wireless network). But it's a great little device, and our Sony Dash won't be dashing out of the house anytime soon! Just in time for the holiday season, you could win your own Sony Dash personal internet viewer! Sony gave me a second Dash to give away to one lucky Bonggamom Finds reader. Update 10/24/10: Sorry everyone! I guess you can tell I copy and paste my giveaway wording, because my entry requirements for this giveaway were completely unrelated and incorrect. I've changed the entry requirement below -- and since it's my mistake, all entry answers the initial question (it used to say "tell me your favorite Photo Card Creations design") are still valid. Thanks for your patience and sorry for messing that up! Leave a comment on this post and tell me the feature(s) of Sony Dash you would probably enjoy the most. This entry must be completed before extra entries qualify. 4) Share the link to this giveaway (http://tinyurl.com/2clu73e) on your Facebook page (1 entry). 8) Join any of the other current giveaways on Bonggamom Finds (1 entry for each giveaway you join). This giveaway ends at 11:59PM PST on November 15, 2010; I will draw a winner at random on November 16 and post the winner's name after the winner confirms acceptance. US addresses only. For additional giveaway rules, click here. Good luck! Disclosure: Sony Dash invited me and other bloggers to a lunch and Dash demo. At the event, I received a gift card to Marlowe restaurant, a Sony Dash to keep, and a second Dash that I will be mailing out to the winner of this giveaway. I was not paid to review the product or give my opinions. The views and opinions expressed here are my own. Even babies can help in the fight against breast cancer! Baby toy company Bright Starts has a collection of toys -- the Pretty in Pink collection -- that donate a portion of all sales towards breast cancer research. The collection includes an activity gym, toy bar, rattle, blocks, bracelets, teethers, and other adorably pink baby toys. The baby girls of today will grow into the women of tomorrow, and it's never too early for them to help! Zubels' breast cancer awareness bear -- the Lynn Sage Bear -- is hand made by talented artisans using 100% organic cotton eco-friendly yarns. Even better, 100% of the profits from the sale of this bear will go to the Lynn Sage Foundation for breast cancer research-- and you can buy this pink ribbon bear not just in October, but year round. Zoobie Pets are thinking pink for this month's Breast Cancer Campaign! These loveable plush animals are part toy, part blanket and all cuteness. There's no better time to pick up your very own pink pet than now, because when you order online today at zoobies.com, you get 10% off when you type in "awareness" as a coupon code! Zoobies will also donate an additional 10% toward breast cancer awareness for every purchase with the code. Order from their selection of pink pets, like Hada the Hippo™. I've always loved Oriental Trading, and now I love them even more. Because From June 1, 2010 - June 1, 2011, Oriental Trading will donate $3.00 of the $5.99 retail sales price of each Pink Ribbon Rubber Duckies set sold to Susan G. Komen for the Cure® with a minimum guaranteed donation of $100,000. While walking the Susan G. Komen 3-Day for the Cure, I passed quite a few people selling pink-ribbon themed items, mostly to raise money for their own 3-Day walks. I bought these Bandz of Hope as soon as I saw them, because my kids love Silly Bands and I was happy to help someone meet their fundraising minimums. What I didn't know is that the site that sells them, Shopping For A Cure, also donates all net proceeds from sales to the Susan G. Komen foundation. So my kids are happy, the person I bought it from gets $5 more towards her walk, and money gets donated to breast cancer research. Brilliant! BTW, you can find more great products benefiting breast cancer research on this blog. Only 11 days in October, stay tuned for more Pink Posts! The holidays are coming up, and it's time to start thinking of ordering your holiday cards! Photo Card Creations has just introduced a bunch of new holiday card designs for the 2010 Season, including some Ornate & Scallop die-cut cards, as well as a line of Circle Ornament Photo Cards that are truly unique. Photo Card Creations is a leading online retailer of custom photo thank you cards, invitations and announcements. They specialize in holiday, wedding, baby & party cards of all kinds. Their cards are printed on the highest quality paper using leading edge printing technologies. Their easy to navigate website makes it simple for customers to search for their favorite card & their user friendly Ordering System & Fast Turnaround make ordering quick & easy! Their cards are designed using current trends by talented graphic artists who will work with each customer to customize their cards to reflect their own personal style. With a professional graphic designer personally handling each order, Photo Card Creations offer a more hands-on approach to customer service than many of it’s competitors. Their professional designers will check each order for missing info., spell check text, check the quality of the digital files submitted, do minor photo editing & design each order by hand. They can also customize most card layouts changing the size/shape of the photos to fit the card design perfectly ! I love this holiday ornament card; not only do you get a cute card, you get a keepsake ornament to hang on your tree. You can even order this design to use as a gift tag! And how cute would a whole tree-full of these card ornaments be? Now here's something you don't see every day. If you want to stand out in a sea of ordinary square cards, this die-cut card is just what the holiday spirits ordered. This classic photo holiday card design is beautiful, but I think the scalloped edges give it a real zing. It's simple, but it's cheerful and it's whimsical and it's fun and it's cute -- which all adds up to the perfect holiday card. Photo Card Creations is sending me some sample cards to try out, and I can't wait to see if the real thing is as beautiful and high-quality as they seem to be on the website! And guess what, one of you will also get to try their cards for yourself! Could it be you? Join the giveaway below and find out! One lucky Bonggamom Finds reader will win a $50 Gift Certificate to use on PhotoCardCreations.com. The certificate expires on 12/31/2010, so you can use it to get started on your holiday cards order! Leave a comment on this post and tell me which of the designs in the Photo Card Creations holiday collection is your favorite. This entry must be completed before extra entries qualify. 4) Write on the Photo Card Creations Facebook page wall, telling them Bonggamom sent you, and telling them which of their holiday cards you love the best (1 entry). This giveaway ends at 11:59PM PST on November 3, 2010; I will draw a winner at random on November 4 and post the winner's name after the winner confirms acceptance. Gift certificate expires on 12/31/2010. For additional giveaway rules, click here. Good luck! Disclosure: Photo Card Creations is providing the gift certificate giveaway prize. I will be receiving some complimentary samples from Photo Card Creations to review,, but have not not paid to review the product or give my opinions. Product information is provided by the Photo Card Creations and is clearly indicated as such. The views and opinions expressed here are my own.